The new film UNDERCOVER DUET (MAN LUNG DUT GWING) yesterday promoted in Tsuen Wan. Ava Yu Kiu, Coffee Lam Chin Yu and Lydia Tong Bui Sze performed difficult yoga poses with several internet god contestants. Yu Kiu had a hard time with the performance, Tong Bui Sze was OK. Coffee the yoga instructor of course was able to complete the poses with ease. Afterward she praised Yu Kiu for having a knack for yoga. Yu Kiu revealed that she wore three layers to prevent wardrobe malfunction. Did she suffer any side effect from the one at last promotion? She said, "That time I asked the assistant to buy tape, the ones that he bought I couldn't use so I didn't. I didn't fire him. He is always making me laugh and bringing me joy. I even posed my photo with him on social networks. People thought he was (Adason Lo) Law Lik Wai." Speaking of her impression of a "male god", Yu Kiu said, "I feel the standard of a god would have to be like (Julian) Cheung Chi Lam. Handsome, nice and with no temper. (Law Lik Wai constantly looks upset.) No, he was born with a frown. That is when he looks relaxed. He had no need to defend against the reporters so he relaxed!" 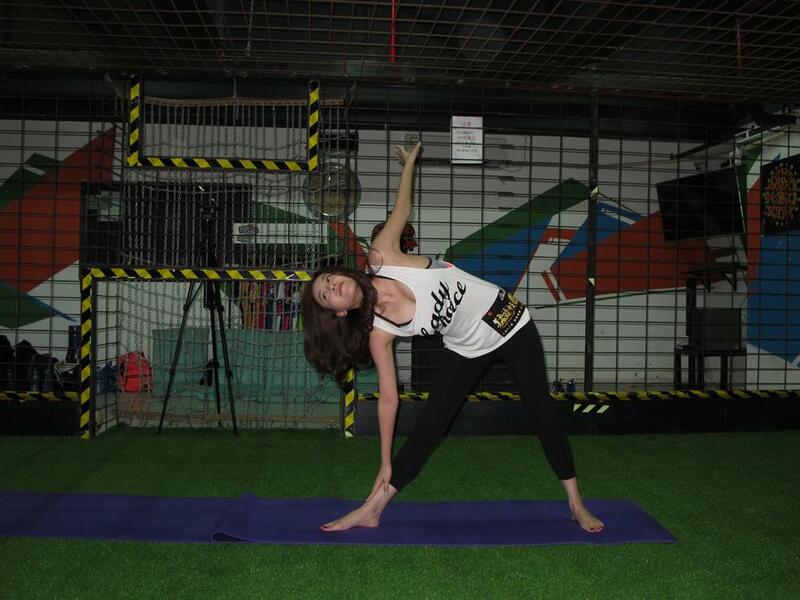 Coffee said that she injured her right left during a yoga photo shoot two days ago. "The poses just now hurt a little. I haven't seen a doctor yet so I don't know if it's serious or not. I am teaching yoga, I hope it won't affect that. Earlier I had to skip classes to promote and the students complained a little. (Were the male students upset?) Half of my students are boys, men, maybe you can call them guys. (Your "handicapped bathroom news" drew them to learn?) No, but my classes are very tightly scheduled. Many students are the first class say they are very relaxed. We even became friends."